It is true one of the greatest advantages of driving motorbikes and bikes in the city centre is their ability for fast manouvering and ease to find a quck parking spot!! A very large part of our work involves transportation of larger parcels or multiple item deliveries that a bike or motorbike would not be able to handle. Indeed many of these consignments need to travel across all counties of Ireland and Northern Ireland to reach their destinations. For all of that we are delighted to put at our customers’ disposal our ever growing fleet of cars, vans and trucks. 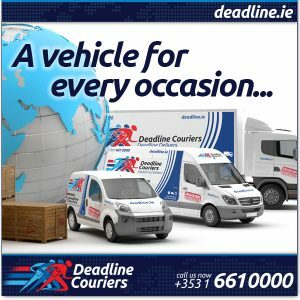 An it is literally we say ‘a vehicle for every occasion’… Deadline’s fleet includes cars and small vans for speed and flexibility, able to pick up and deliver small to medium size loads or small number of items and quickly fulfil our same day deliveries and urgent direct jobs. We also boast a fleet of large vans and trucks, often engaged in scheduled delivery services for our customers, but also regularly offering ‘ad hoc’ courier sevices. All our trucks are fitted with a back lift making them perfectly suited for the transport of pallets and large parcels. In fact, many of our trucks also feature side curtain loading, ideal for awkward consignments that just can be loaded through the back. These trucks make Deadline a key provider of trasnport services for specific sectors such as the construction and building industry for example. Lastly, the larger vehicles on our fleet are our refrigerated trucks, which work around the clock to deliver food and perishable products. Many of these deliveries are performed on regular scheduled contracts for supermarkets, catering firms and other food related companies. We are always willing to offer bespoke solutions to business to make distribution and transport an easy, reliable and cost efficient affair.